Classic Science Fiction at its best! Originally published in 1952, The Tom Corbett adventures by Carey Rockwell paved the way for the way for the sci-fi books and movies of the 1950's and 60's. Put modern science on the back shelf and blast off at "full space speed" in this, the first, installment that follows the adventures of three cadets as they rocket into space.Remember when rockets were shaped like javelins with fins and being a "space cadet" was a good thing?Revisit the days when spaceships were piloted "by the seat of the pants." When women scientists invented the hyper-drive. When space cadets saved the solar system without the help of their senior officers. Come back, in short, to the glory days of Tom Corbett, Space Cadet! The cadets, Tom, Roger and Astro were always in trouble with their commanding officers, even though the cadets had braved dangerous assignments and the everyday hazards of space flight. Over and over the cadets are on the carpet trying to prove they were innocent of any wrong doing. Roger had a knack for getting the unit into trouble, which would require them to work as a team and prove their innocence. 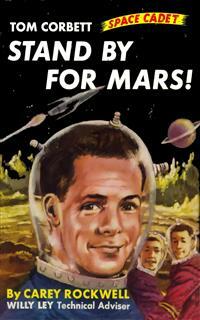 Join them on their first mission as they Stand By For Mars!